Last night I went to dinner with my friend Heather Scott, library marketing goddess and NYC afficionado. At Heather's recommendation, we met at O'Neills, an Irish pub at 3rd Ave. and 46th St. I know, right? You wouldn't think much of the location. But the food is some of the best pub food I've had. I can't recommend the bangers and mash enough - the sausage was crispy (but not burned) on the outside and intensely flavorful and moist inside. A treat. Heather made me her chipotle brownies! Sadly, I don't have the recipe. Quite frankly, I don't really want to know how they're made. Am I the only foodie that sometimes feels as if the beauty and spontaneity of food can be ruined by getting the recipe? Asking Heather for the recipe would have completely taken me out of the moment. So I am sorry to disappoint those of you wanting to immediately recreate this. However, I can tell you that this is a family recipe of Heather's. Heather has tweaked it to include chipotle, vanilla sugar, and cinnamon. So I would imagine that you could take your favorite brownie recipe, such as Ina Garten's Outrageous Brownies, and play around with the flavors to taste. I'm of the opinion that Heather got it just right: the chipotle and cinnamon don't give the brownies heat...they give them warmth. Kinda of like a great night out with a friend. Eat, drink, and cultivate friendships. 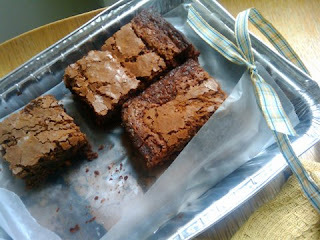 and Laura, I'm honored you blogged my brownies! for anyone who's interested, I don't have a real measurement for the 'warmth'-- after I've mixed everything else, I dash some cinnamon and some chipotle powder until it seems right. and I err on the side of lighter chile flavor-- the flavor infuses and perks up as the brownies bake!